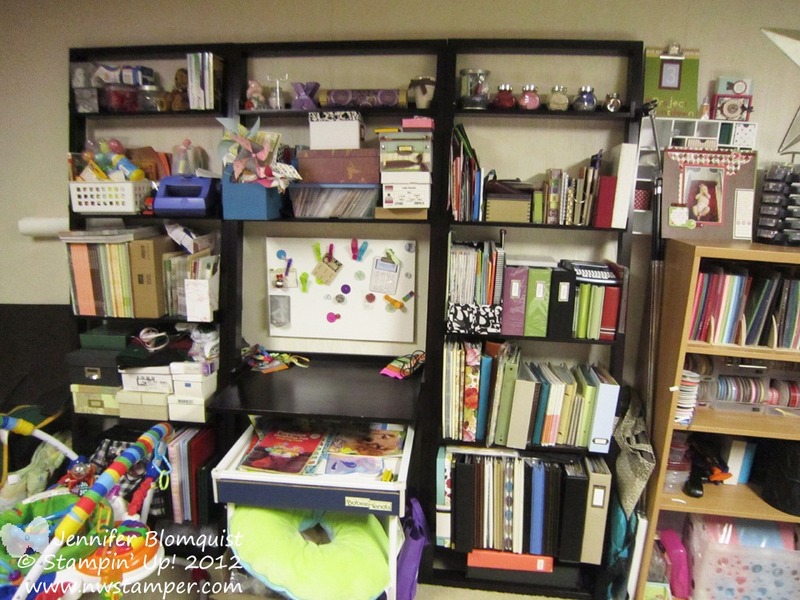 I was sharing on my Facebook page last week the utter scariness of my craft room after I decided that I needed to rearrange my furniture…again… and get a new bookcase to hold my stamps. I did not expect this project to take over my craft room floor so completely! Yikes! See, it all started when I was putting away my new stamps and supplies from convention this year and I started getting frustrated with my stamp storage. I had been using a bookcase to hold my stamps and trying to put all my clear mount stamps on a shelf that was at eye-level when I was sitting at my desk. That way, when I turned around, I could easily see what I had. But I had too many stamps for one shelf (more like 3+) and so for the rest of my stamps, they were pushed to the back of the shelf which meant they were really hard to see a lot of time time. So, I decided I wanted a bookcase that was less deep, and I remembered my good friend, Ikea, had just what I needed. And so off to shop I went. A week later, I finally had everything back sorted and put together and am really happy with how it turned out! 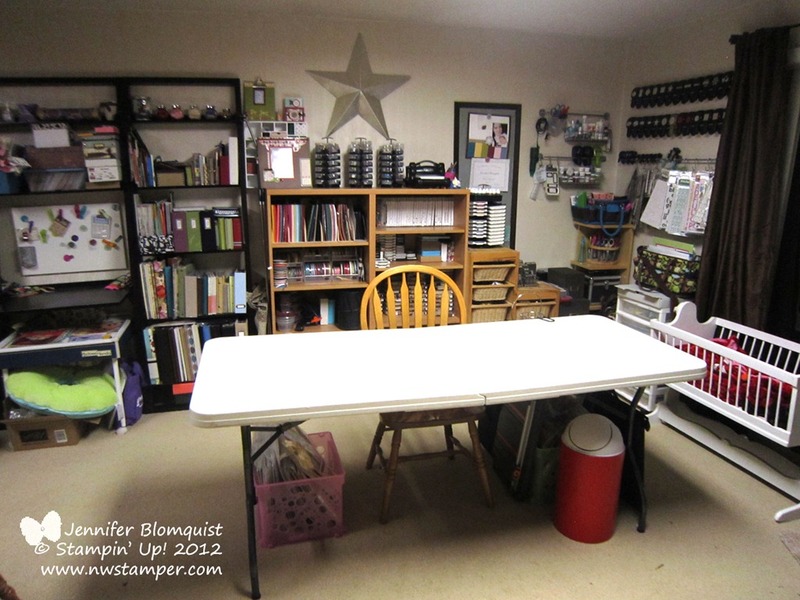 Take a Tour of my Crafting Space! 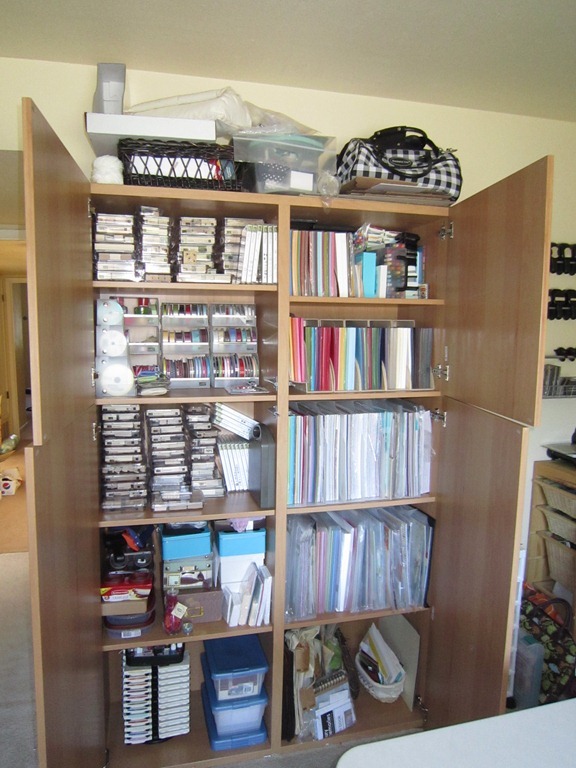 I often get asked how I store my different crafting supplies, so I thought I would give you a little tour of what my craft room is like today. If you have any questions, just let me know! 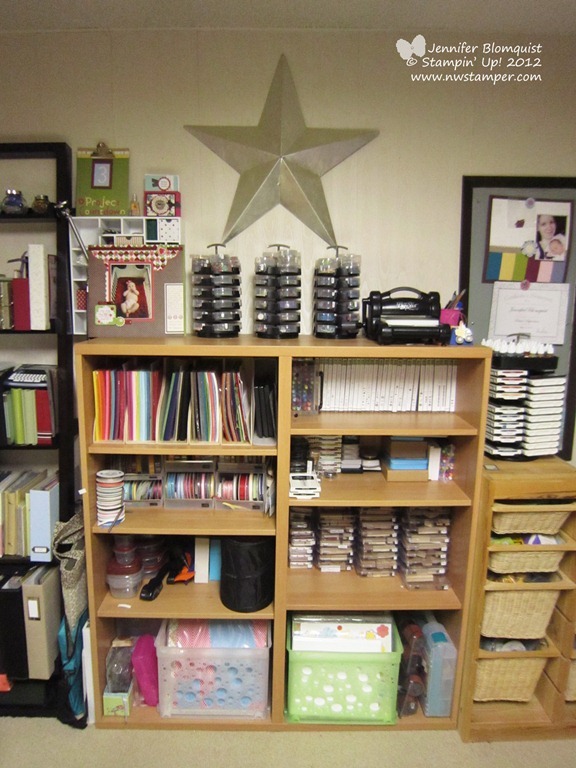 I will say my craft room is almost entirely made up of storage solutions from either Ikea or Stampin’ Up! and I am really happy with how it is working for me! So the most important thing for me, as I’ve been constantly tweaking my crafting space layout, is to have my most important/most used items very close at hand. So most things are out on a shelf and within reach while sitting or something I can see clearly when I’m sitting down and then I just have to take a step to grab what I want. 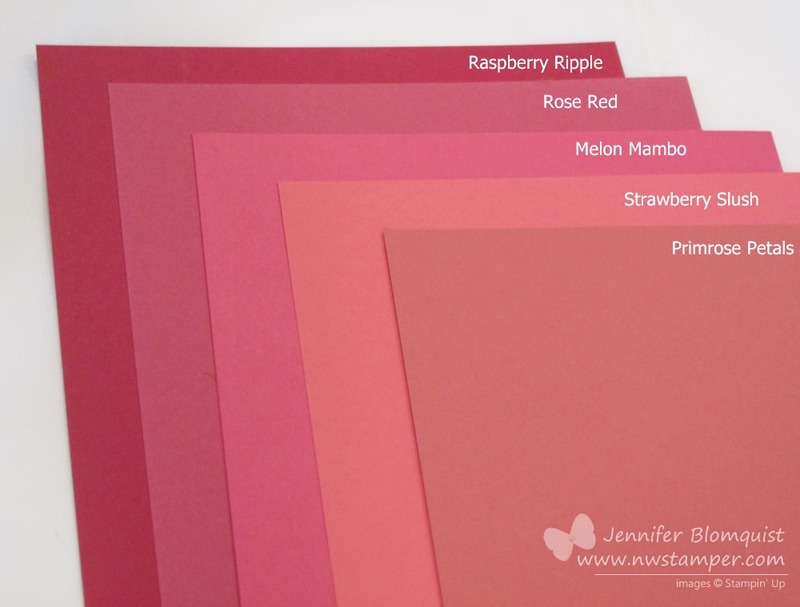 I’ve always loved seeing what the new colors look like compared to the other colors in the Stampin’ Up! family (to help me get a feel for what the colors are really like). 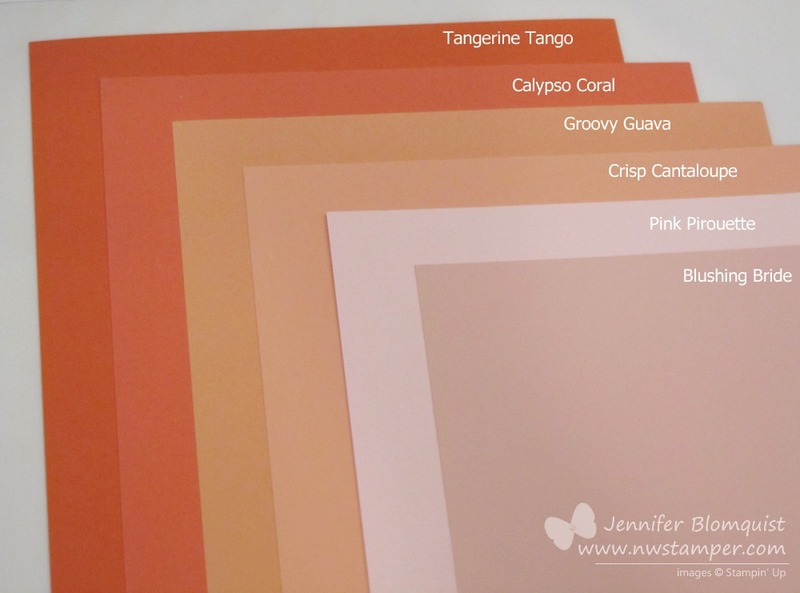 And with us gaining 10 new core colors this month plus the 5 new In Colors, I thought there might be a lot of wondering going on. So, I hope that was helpful! If you have any questions or need any other comparison pictures just let me know! And if you find yourself needing one of those new colors, you can pick them up today through the Online Store! Or even better, get them free as part of my Everyone’s a Winner event! 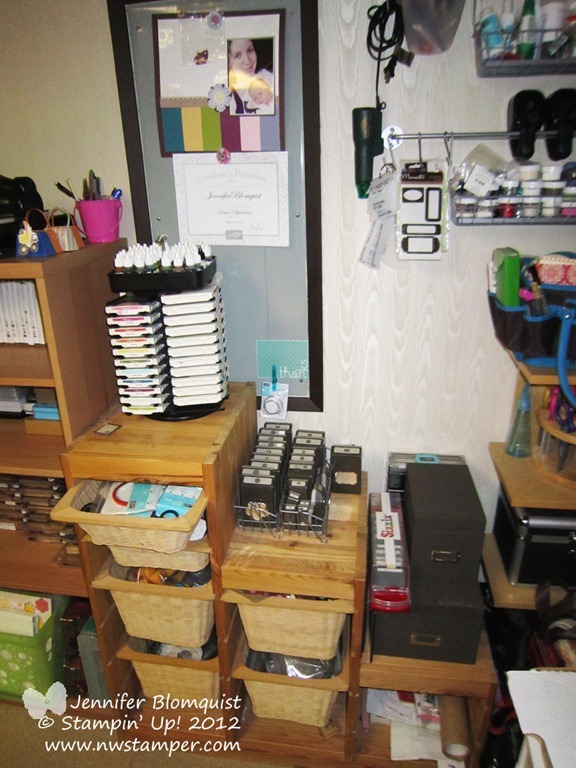 Recently as I reorganized my craft room, I had folks asking to see what I had changed and how I had organized. So, in one of those very rare moments a few weeks ago where the surfaces in my scrap area were actually clean, I took a few pictures to share with you. Now that I’m actually writing up the post to go with them, I’m realizing that some of the pictures are dark or I didn’t get a close-up of something I thought was interesting; but in the interest of actually getting this post up (and who knows when I’ll get my room this clean again! ) I thought I would share what I have. So, if you are curious about a part of my organization that I don’t have a close up photo of, leave me a comment and I’ll see about getting a picture and more explanation for you! So, this is a close-to-all-encompassing shot of my craft space. To the right (behind the cradle) is the sliding glass door to our backyard. So, when I’m crafting in the afternoon, I actually get some nice natural light. But in general, I’ve optimized to be out of the way of my 2.5 yr old running in and out of the house and to be within arms reach of my most common supplies. The Most Used Stuff is in Arm’s Reach! 70-80% of what I use to make most of my projects can be seen in this picture and was my biggest area of optimization so that I could be sitting at my table and just swivel around in my chair and reach what I needed. So, the most important things… my stamps, cardstock, ink, and embellishments are right there where I can grab them as I’m designing. This may seem like a duh moment for you but after almost a year of having things on shelves scattered across the room; this was huge for me. For example, I was getting soooo sick of wanting to grab a piece of cardstock and being so irritated that I had to get out of my chair and walk across the room to grab a piece of paper. I know totally lazy! But when you are only getting in craft time in 20 minute increments due to overlapping nap times, you suddenly care about every minute! 1. Having my cardstock right there and easy to grab! I use those magazine holders for your shelves only instead of having them stand upright (so you can see the short front panel facing out) – I tilt them on their back so that what is normally the top is actually facing out. This gives me tall sides to hold up my paper but maximizes allowing me to see the colors I have and I don’t have to take the holders off the shelf to get a piece of cardstock out! 3. Can you tell I love my Stack and Store embellishment caddies? Seriously, LOVE THEM! Again, this came down to me realizing that if I can’t easily see the embellishment, I’m not going to remember to use it. These things spin like a dream and I can use empty embellishment containers to store extras of random stuff I’ve been hording for years. I swear I’ll use everything someday… no really…. ! 4. Stamps and Ink are right there! I used to have my retired stamps over in a cupboard and my current stamps near by. But I realized that separating them out like that meant I NEVER used my retired stamps and also had a false sense of how many stamps I had because I only saw the current ones. So, now I have all my stamps grouped together and just have marked on the outside of the stamp boxes which stamps are retired. I can spin my Ink caddy from my chair and then the top drawer of my unit contains all my different adhesives and adhesive bling. 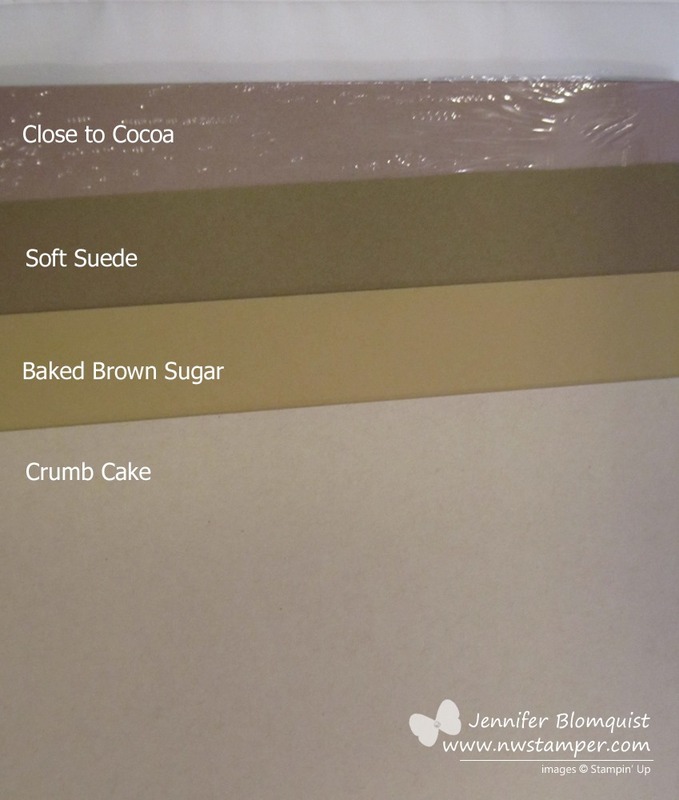 So, when I need a Stampin’ Dimensional or some Sticky Strip, it is right there. A little further out of my reach (so I actually have to stand up for this one) are my punches and Big Shot dies. Yes, I use punches or dies on just about everything I create – but something had to be further away and they just fit so nicely here don’t you think? You can also catch a glimpse of my hanging racks that hold my glitter, embossing powder, and heat gun (which has newly been replaced by the new fabulous SU heat gun). I swear it doesn’t look this messy/cluttered in real life! But I commandeered this Pottery Barn bookshelf and desk combo from my Hubby when we moved back into this house and it turned out to be the perfect size for my scrapbook albums and Stampin’ Up! 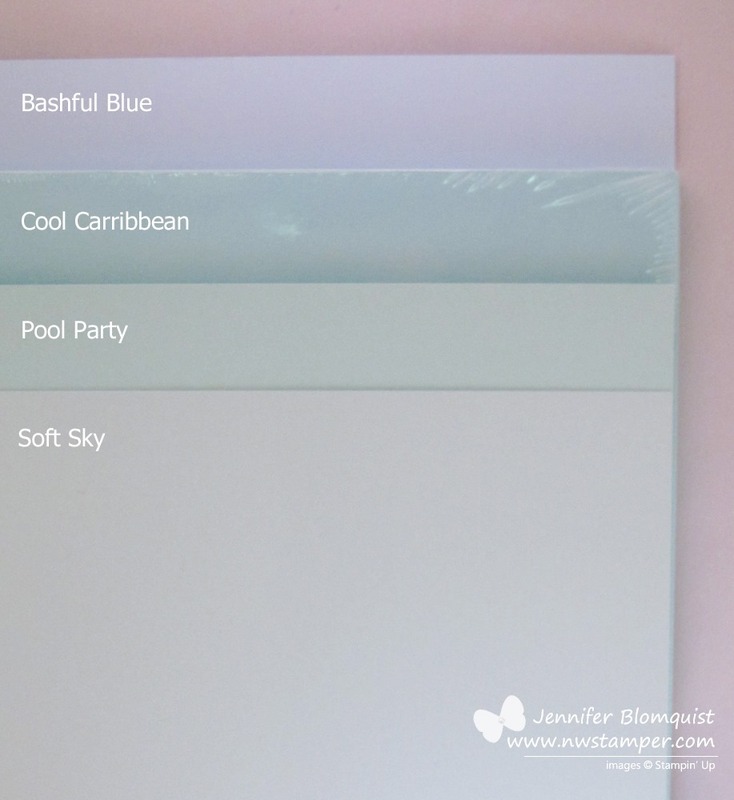 catalogs! So, the shelves are full of albums, premade cards (that is those boxes on the center middle shelf), catalogs, and misc extras. I try to keep the desk area clean for overnight guests to use or to have a small area for picture taking. And last, is the big pantry (yes, this bookcase was literally purchased to be a pantry when we lived in a smaller apartment!) I LOVE how strong these shelves are, and with the doors, this became a perfect storage spot for my extra tools, class items, and 12×12 cardstock. To be honest, I have about 2 shelves in this entire bookcase that I grab supplies from regularly; so it is great to have a place to put everything else and close the door to keep toddler hands away and extra mess contained! 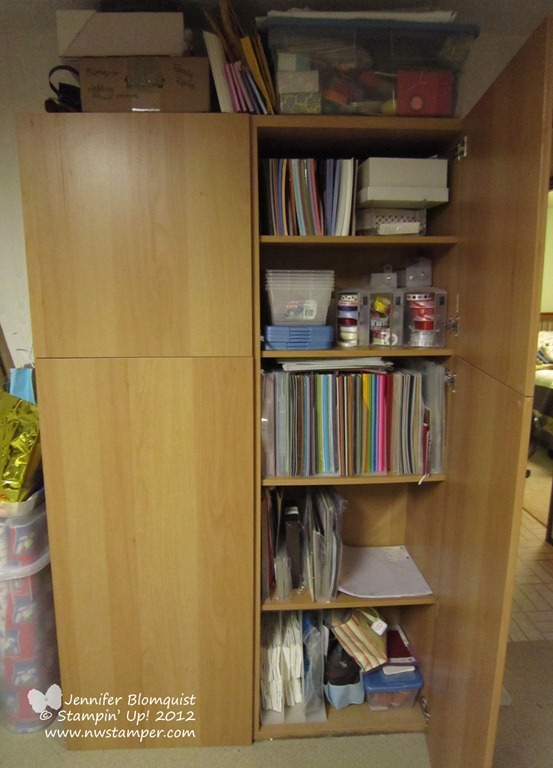 So, hopefully these pictures help give you some ideas for how to store your supplies. 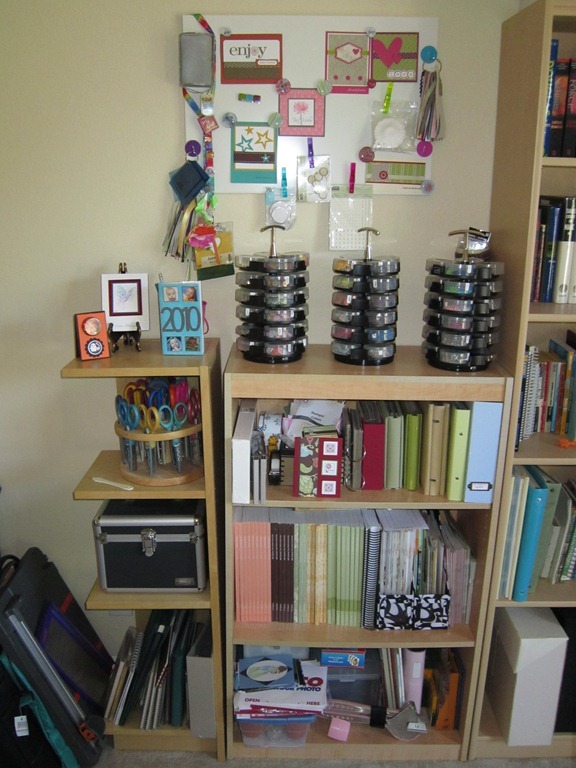 I’ve found that since I reorganized, I get so much more done and with less hassle! My big tip? Keep the supplies you use most often within reach of your crafting chair! 2. BYGEL rails and baskets from IKEA – I found these to be cheap (like a few bucks a rod – cheap) and be PERFECT for punch storage. 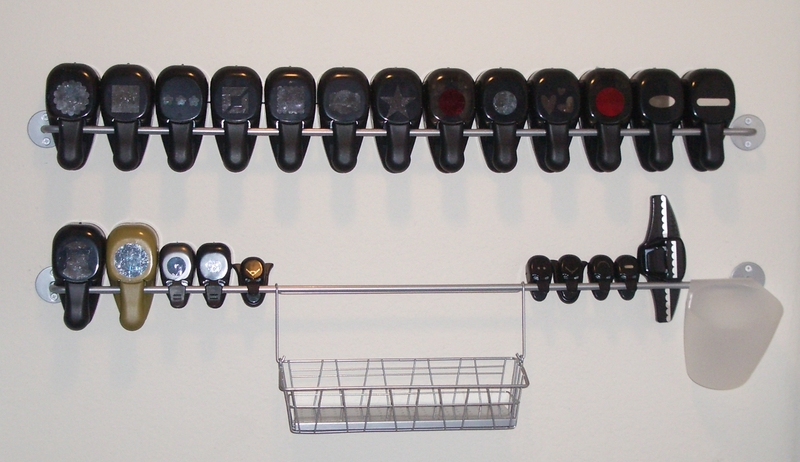 I store my old “whale tail” black punches on the wall from these racks. But even cooler is the $1.99 wire baskets that they sell to hang on the rods are an exact fit for the new slimline punches! So, another easy organization move. 4. Stack and Store caddy from Stampin’ Up! – I haven’t seen anything like it but I cannot do without my caddies (check out the Stack and Store caddies online). I love that I can stand there and spin my rack to see everything I have in the way of brads/buttons/eyelets/beads/etc, and so I use my stash! Having items in a drawer just didn’t work for me. Like I said, if you have any questions or are curious about something I didn’t point out specifically, leave me a comment and I’ll try to give you more details to try at home! Are you earning your Northwest Stamper Rewards? Every order gets you closer to your FREE stamp set! Click here to learn more! Between the big color renovation, the old catalog retirement, and getting ready for convention, my craft area had become a disaster zone. 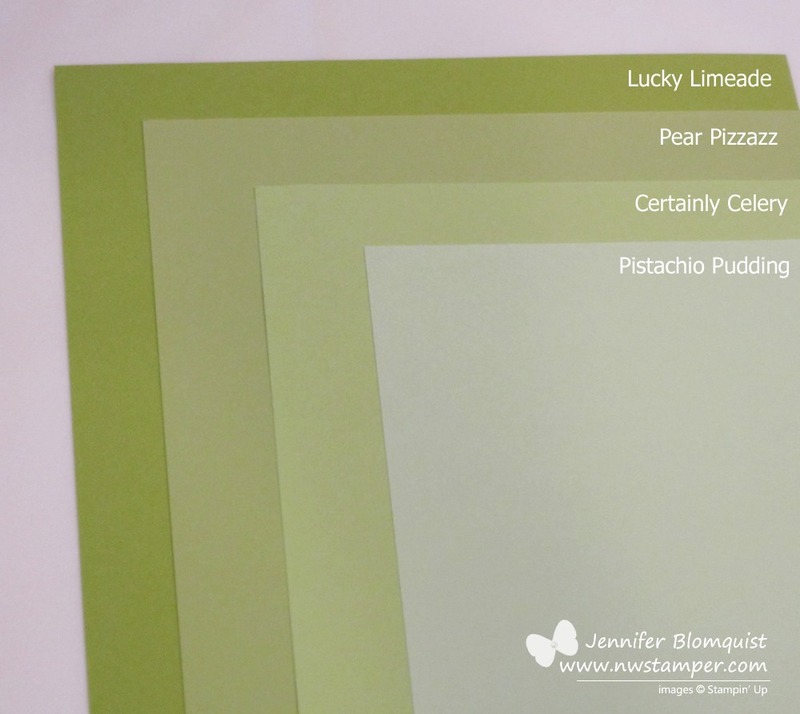 You know the feeling… table buried under paper scraps, adhesive backing, ribbon, stamps, half completed projects. Well, I decided it was time to dig out and get organized so I can start using all the cute and fun new stuff that I’ve gotten recently. Now I’ve gotten everything put away and it is definitely more motivating to craft. If you have any tips or tricks for organizing, I’d love to hear about them. Please leave a comment and/or a link to a photo of your creative organizational techniques. For me, I love this bookshelf I got at IKEA (its called Besta). It is very strong, which I need for all the paper I’ve accumulated. I have a shelf for retired stamps, ribbon, current stamps, cardstock, 12×12 paper, ink, wheels, and misc other stuff. Plus the doors keep it out of the sun and away from little baby fingers. Tip: Turn you paper holders (the mazagine file style) on their backs so what is normally the top is pointed to the front. 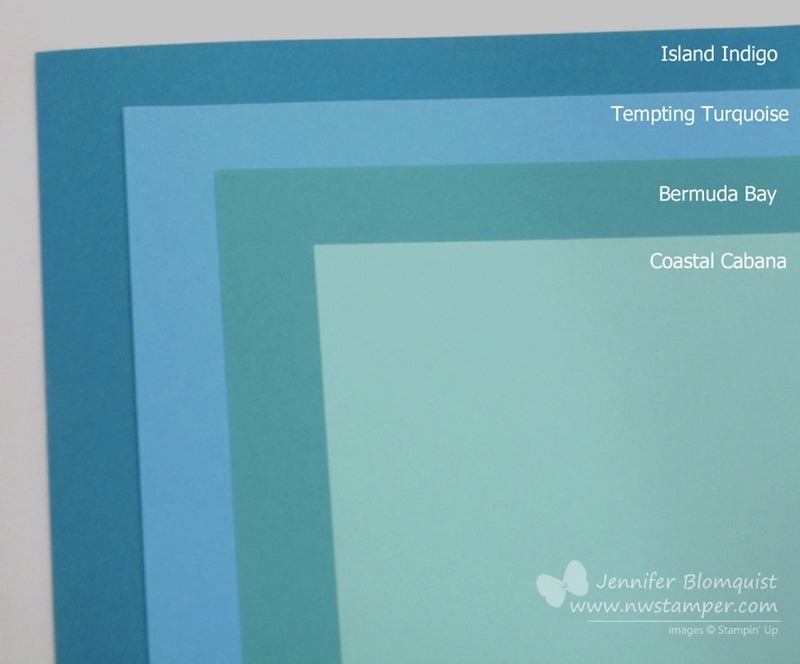 This makes it really easy to see what paper you have and you can grab and go without pulling out the whole container. 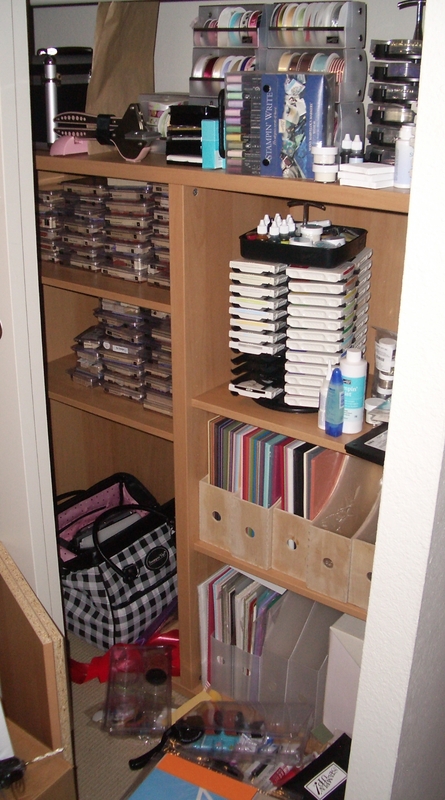 I also have a smaller bookcase where I store my catalogs, magazines, small albums and my stack and store spinners. Let me tell you, I LOVE these spinners and for some reason it just makes me so happy and ready to embellish when I see them sitting out in a row. 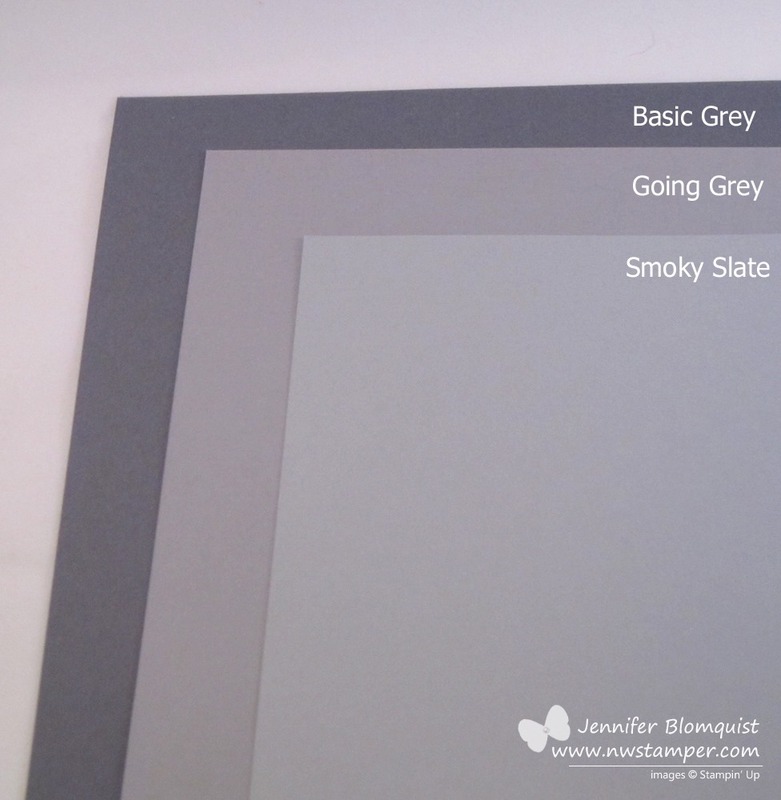 Tip: Use a magnetic board (again, I found this one at IKEA) to put up cards or projects that inspire you. 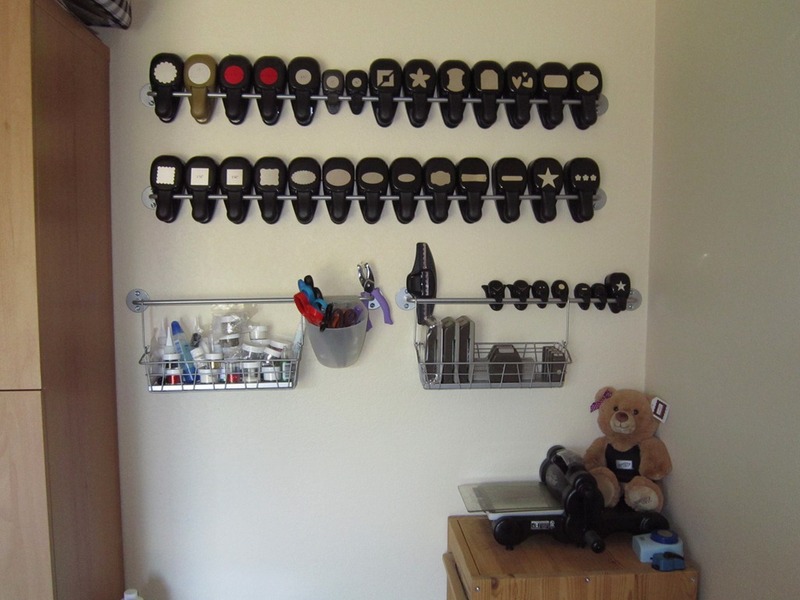 Hang embellishments that you want to use but don’t have an easy storage space with magnetic clips so that they are in front of you (so you remember to use them) and easy to grab and then put away. You can also get magnetic spice containers with clear lids to store small items like die cuts, brads, or gems. Finally, I have my punch storage. These rods work perfectly for the old style of punches and I recently found that the hanging wire baskets that you can get to go with them are just the right size for the new slim style of punches. It’s the perfect system for a punch junkie like me. These rods were in the kitchen section of IKEA and are the Bygel collection. They are something like $1.99 per rod and $1.99 per basket, I love cheap and super functional! So that is my craft space. Hopefully you saw some new idea or at least a reminder for one of your own projects. I’d love to hear your thoughts on what organization solution you like or if you have some new ideas for me! Until next time, I’m off to make a mess again! Ever have one of those projects that keep you obsessed until you get it done? 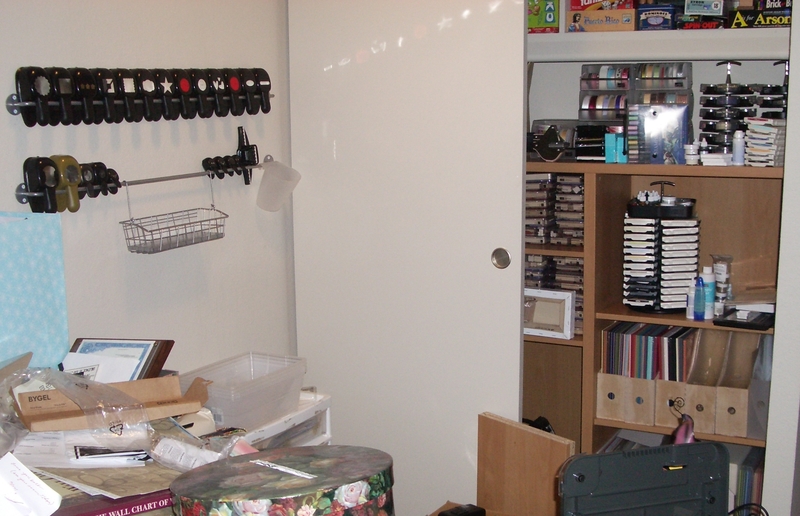 My craft room is one of those projects. After two weeks of being super busy (out of town on a business trip and my MIL visiting), the house is finally quiet again. 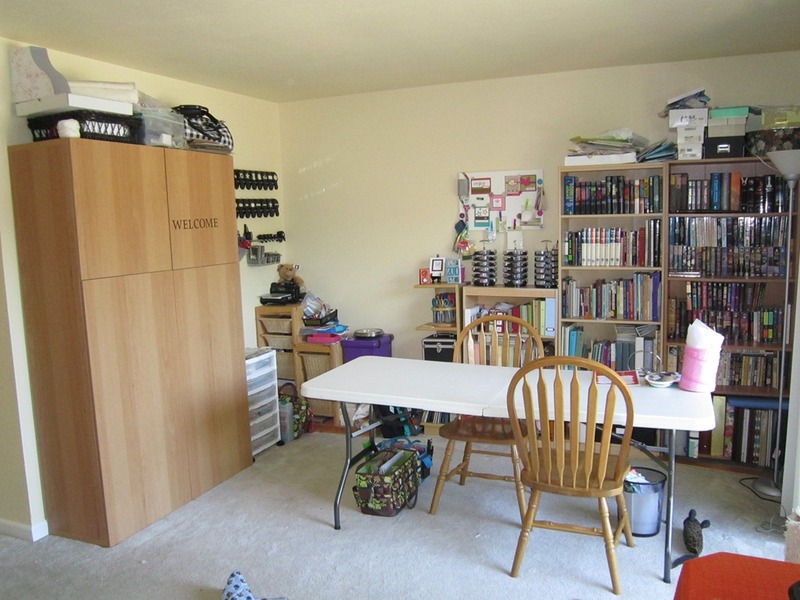 While my MIL was here, she helped me get motivated to organize my space and move all my crafting stuff out of the dining room and into my office/craft room. Now, this is the room that has never been unpacked completely since we moved in last fall and so it has been the holding space for tons of boxes and misc stuff. So this project is not one to be taken lightly. However, after much debate, I decided to go to Ikea and get a bookcase as a storage solution for my office closet and rods to hang my punches from for the walls. While she was still here, I managed to finish building the bookcase, but didn’t have a chance to hang the rods or finish moving everything in to the craft room. So, now, instead of creating projects (which I need to do), I’ve been obsessed with finishing the migration to my new craft space. So, since I don’t have a card or craft project to share, I thought I would show you what has been taking up some of my evening time. I even manned the power drill last night and drilled and hung the rods I’m using for my punches! Ignore the surrounding mess in the pictures; hopefully I’ll have some clean awesome space pictures to show you next week!